Representing leading machine manufacturers in the fields of dairy, oils and fats, Winckler and Co. is able to provide in depth process knowledge to help customers maximize production quality and efficiency. We understand the challenges of limited product shelf life and the strict regulations demanded by the Japanese market and are able to meet them. Turnkey packaging and box lining solutions for industrial packaging. Bulk packaging machines and fully automated lines used for: tobacco, nuts & dried fruits, frozen foods, edible oils & fats, fish, meat, bread, chocolate and other food industries. Leading "Form-Fill-Seal" technology (FFS), offering maximum flexibility, reliability and quality production lines. 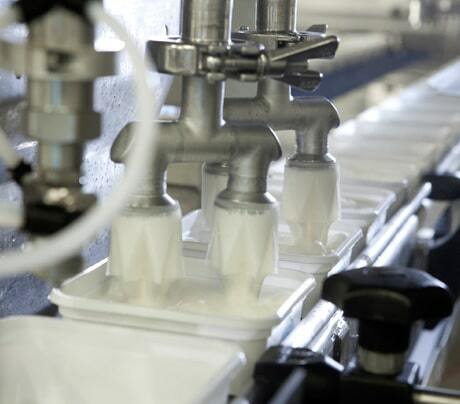 Specialized machines used for the production, processing and packaging of cheese. Specialist machines for dosing portions of processed cheese into triangular packages. Packaged products include: Soup Cubes, Processed Cheese, Butter, Margarine and Yeast. Turnkey solutions for the production and processing of margarine, butter, spreads, shortening, puff pastry, ice cream, mayonnaise, sauces and dressings.